Sadie Jezierski has become one of college women's most thrilling athletes, and her aggressiveness is only part of her unique style of play. This college women’s feature is presented by VC Ultimate as part of their season-long support of our women’s coverage. All opinions are those of the authors. Please support the brands that make Ultiworld possible and shop at VC Ultimate! Who’s the most exciting player in women’s college ultimate? Before we can answer that we must answer a different question first. What’s the most exciting play in ultimate? Is it a lethal, mark-breaking, huge around backhand? A bladey, pinpoint forehand that slices through the air as quickly as it shreds up defenses? A massive huck, an incisive give-and-go, a monster layout, or a posterizing sky? It’s difficult to say, and everyone will have a different opinion. With #9 Ohio State Fever senior Sadie Jezierski, no one has to choose just one. Every time the former US U20 National Team competitor and three-time college Nationals attendee steps on the field, she displays everything that is most exciting about the sport. And yet no one else plays the game like she does: with an almost disrespectful level of fearlessness. She’s a gunslinger. Her athleticism is at the top end of the spectrum. Above all else, she’s a gamer. But the intensity of her furrowed brow as she launches a pull quickly dissolves into a jovial smile. 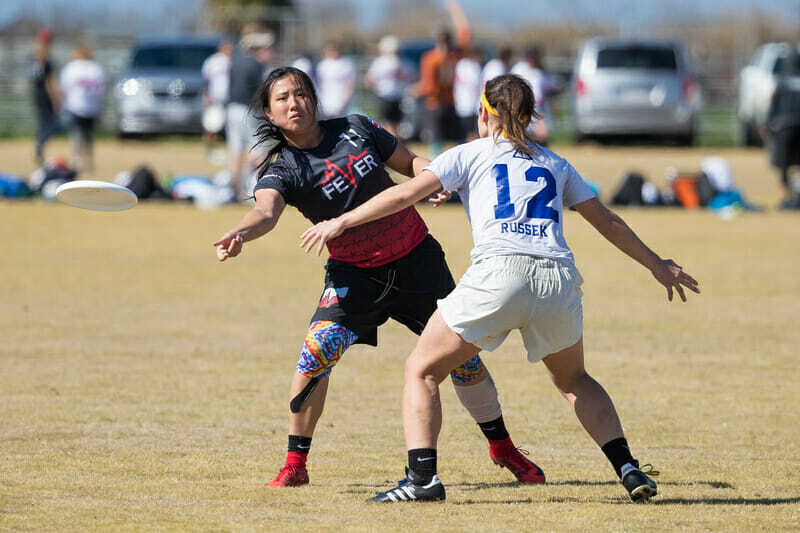 Jezierski brings every aspect of ultimate that makes it such a fun sport to consume, and she seems to enjoy playing as much as spectators enjoy watching her play. That attitude was evident from the very beginning of her playing career. She was first introduced to the game at her middle school in Westfield, New Jersey, where they only had a boys’ team. That was no hindrance to Jezierski, who joined up anyway. Her natural competitiveness helped quickly carve out her place in a division where she was one of only a couple girls. Jezierski did more than enough to prove herself to her male peers. 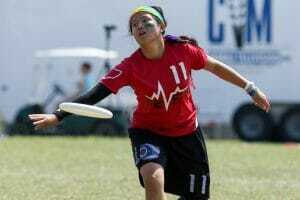 In 2012, she captained the U16 YCC open team from New Jersey, DEVYL. She helped lead DEVYL to the YCC final that year, and was one of the team’s top producers. Jezierski’s talent spoke for itself. That helped to break down any potential barriers between her teammates in regards to her gender. “She was so well respected by her teammates that I am sure they did not even realize that there was a gender difference. Sadie was a top player on a very good YCC team and a bona fide leader,” explained Belline. She switched divisions as she moved up to an age where more girls were also playing ultimate. But she brought that attitude she’d formulated in the open division with her. Jezierski first played at the high school girls level while still in the eighth grade. It was Westfield High School’s first year with a girls’ team and Belline brought Jezierski up to play. There were only nine girls on the team, and they lost every game at their one tournament — the New Jersey State Championships — but Jezierski caught every goal the team scored. Jezierski excelled at boys’ ultimate when she didn’t have the option to play with other girls. She led a high school girls’ team in the eighth grade. Her natural, competitive drive is obvious. But Jezierski has never been a boiling, raging presence. She channels it entirely through her playing style. It’s her natural love for the game that helps keep her aggression in an amiable place. She seems to find joy in every part of ultimate, too, not just the flashy moments that define her style of play. Her favorite play in ultimate? Pulling. Not the layouts, or skies, or crazy throws that have been a part of her game since the beginning. She loves pulling. “I get so amped when I can pull this 70 yard huck to the back corner of the endzone and the disc is still floating through the air as I’m getting closer to my mark,” she said. “I can always just feel an adrenaline rush. Like, dang, I did that, and my teammates can go down, get a dope D, and we can get a break here.” It’s that mentality that set Jezierski on the path to where she is now. She enjoys the game immensely and plays it the most fun way she can. Jezierski continued playing at a transcendent level in New Jersey throughout her high school career, most competitively at the Girls YCC U19 level. “Everyone and their mother saw Sadie and knew how good she was,” said Jezierski’s U19 coach Terence Chen. Stepping up to the U19 level was important for Jezierski’s development. At least in Chen’s opinion, it helped her learn to trust her teammates and not feel like she had to do everything, like she did with her high school team. It can be tough for a lot of players to transition from being the big fish in a small pond, but for Jezierski it was simply a part of her evolution. And she kept her unique skill set and mentality through that growing process. “Her aggression, it’s a hallmark. But I think the biggest evolution from when she was younger to now is she knows when to unleash it. When I first started coaching her, she was like a cannon. You just pointed her in the direction and she just fired it. Now, it’s like a scalpel. You know exactly what you’re getting. She can control it, she knows how to use it. That’s the evolution of her [game,]” said Chen. But Jezierksi and the rest of the dynamic group, as Ball calls them, do break the boundaries of the system sometimes. Ball and Jezierski don’t always immediately agree on if the decision to throw an early stall blade huck was correct or incorrect, but Jezierski always treats their disconnects as important learning moments. In reflecting on how her coaches over the years have influenced on her game, Jezierski mentioned something different that each of them gave her. “Belline showed me the ropes. He taught me how to throw, catch, be aggressive, and all the offensive and defensive sets. He gave me leadership opportunities. He found ways to get me as many playing opportunities as I could,” she said of her first coach. Now in the middle of her fourth year at Ohio State, Jezierski is still writing the final chapters of her school ultimate legacy. But it’s clear that Jezierski is already etching a place for herself in the collective memory of the division, one flick blade at a time. Her trophy cabinet may not be as replete as those considered to be the icons of the game,1 but her playing style, her “urgency without panic,” her dynamism, make her one of the standout players of the division. And Jezierski does have accolades. Beyond her youth success at YCCs, and she was on the US National U20 team that won gold in 2014. She also still has one (or two!) more year of college ultimate left to help her team achieve more than they have since 2014. She’s tossed her name into the conversation for individual awards this season. But Jezierski’s play warrants more than local hero status. In a sport that prides itself on individuality, Jezierski brings that to the field in spades and that should be celebrated. She plays with good spirit, and has remarkable drive and determination. Jezierski’s home is on the ultimate field, and she decorates it in an eccentric way. She plays the game by her own rules sometimes, rules she started creating when she had to prove herself to her male teammates. Her individuality can be frustrating for her coaches, but the adrenaline rush Jezierski gets—from a pull or a blade huck—is so obvious, you can’t help but get a rush too when watching her play. Jezierski plays the game like no one else in the division. She does it well, and nearly always with a smile on her face. And for that, she’s one of the college game’s true heroes. Comments on "Cannon & Scalpel: The Unique Style of Sadie Jezierski"